It seems like everywhere one turns, there is something said or written about Tlaquepaque Arts and Crafts Village, the beloved heart-and-soul of Sedona. While Tlaquepaque has a variety of events that regularly happen within her old-world Mexican walls, there is nothing quite like the popularity of weddings. Attribute it to the romance, the architecture, the chapel, the landscaping, charm, singularity… whatever… there is something for everyone at Tlaquepaque, and that “something” attracts brides by the hundreds to have their special wedding day at Tlaquepaque Arts and Crafts Village. 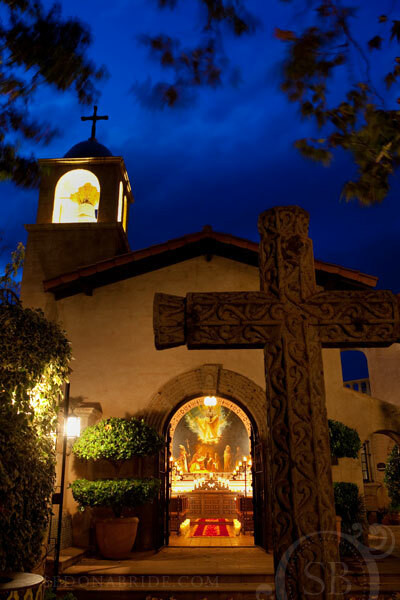 Tlaquepaque Arts and Crafts Village offers Sedona’s only wedding Chapel. Here we see a lovely image by Sedona Bride Photography that graces the cover of Arizona Finest Wedding Sites and Services Magazine. Featured is a rose petal carpet and candle display designed by Events By Show Stoppers and Nectar Design, Tlaquepaque’s in-house floral providers. As evening approaches, the richness of the Tlaquepaque Chapel becomes ever-more inviting as the sky moves into the “blue” hour. Many photographers consider this as their favorite time of day to shoot. We can certainly see why Sedona Bride Photographers love to shoot during this time. Candlelight is a must. 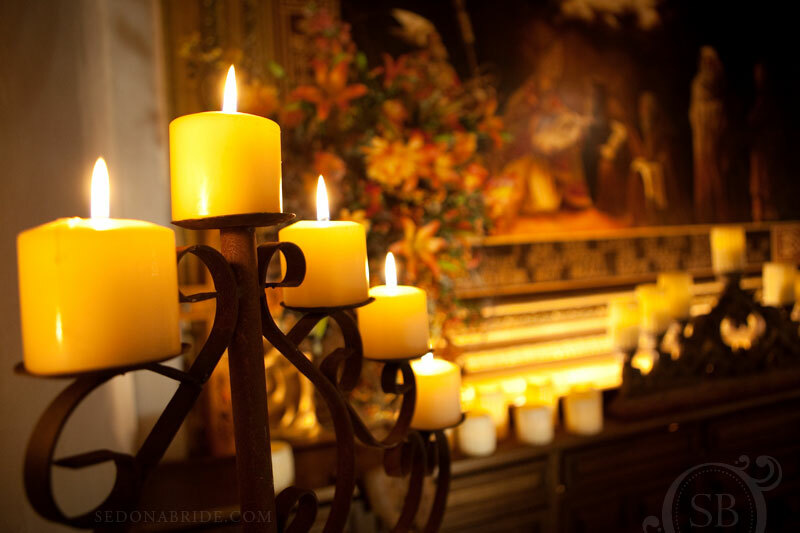 Just imagine exchanging your special wedding vows within this romantic glow that embraces everyone present. There is no other place like it. For booking information, call Tlaquepaque wedding and event specialist, Adam Lovejoy, at 928-282-4838. Around every corner of this exquisite property lies a photo-op, just waiting for brides to get into the moment. Tlaquepaque is about color. The possibilities are endless. 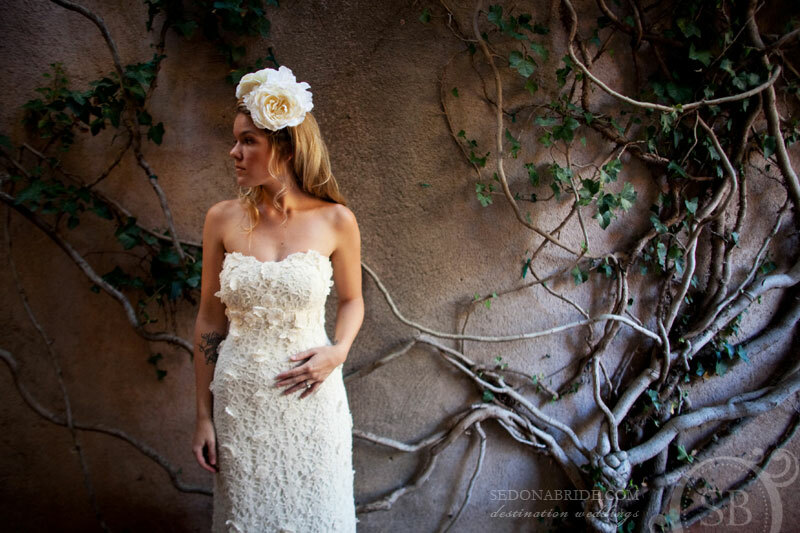 The exceptionally talented members of the Sedona Wedding Studio can make your vision become a reality. Just visit our vendor links at the top left of this page, contact the vendors of your choice and find everything you need! The creativity of Sedona Bride Photography knows no bounds. This captivating shot, coordinated by the talented Laura Marolakos, of Heart of Sedona Weddings, was cleverly set against an old-growth ivy-covered wall. These walls are literally everywhere on the property, growing there since 1973. Hair and make-up is by Patricia Vega, Le Petite Spa de Sedona. 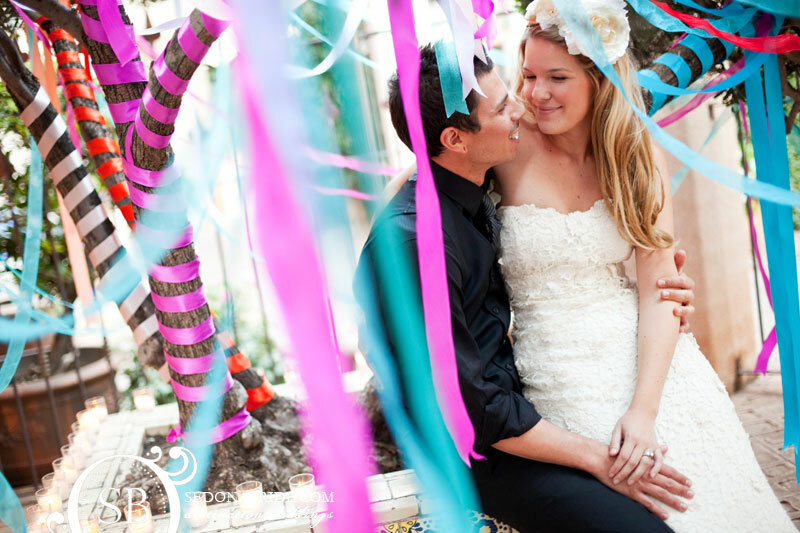 We love this colorful ribbon-covered tree that is just outside the Chapel. Reverend Andrew Murphy, Heart of Sedona Weddings, officiates in front of the famous Patio Del Norte fountain that is regularly decorated by Events By Show Stoppers. This sparkling table setting was coordinated by Laura Marolakos, Heart of Sedona Weddings, with flowers by Events By Show Stoppers. 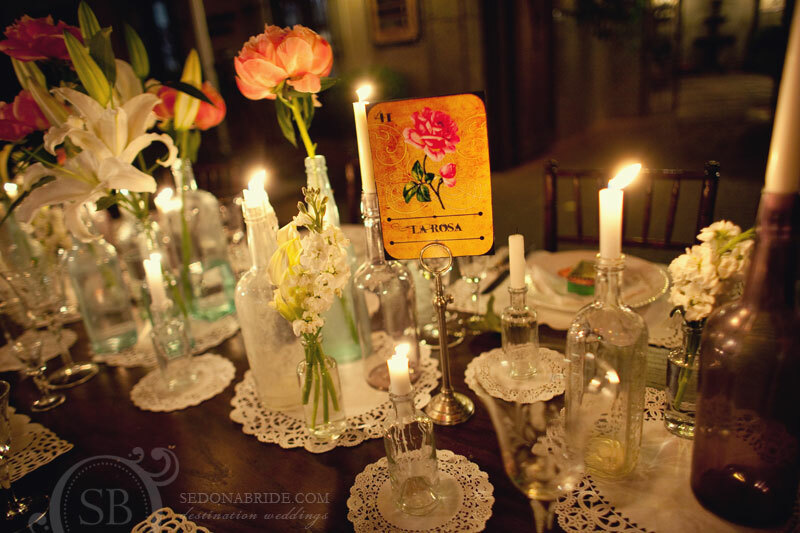 Old bottles, paper doilies and assorted candles finished the look that was celebrated with a romantic kiss. Coordinator, Laura Marolakos, is known for her attention to detail, as seen here with a vintage card used as a table marker. Planning a Sedona Wedding? 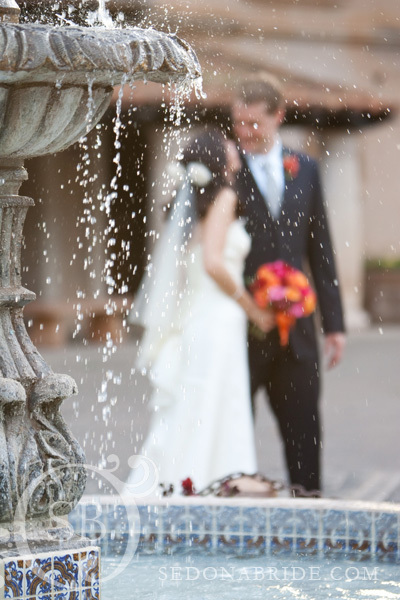 Contact Tlaquepaque weddings and events specialist, Adam Lovejoy, at 928-282-4838. 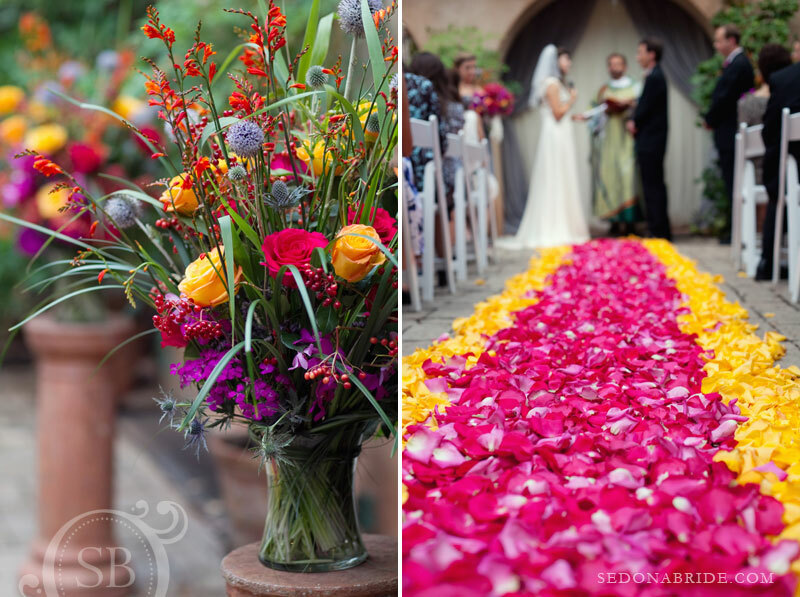 Adam is superb at guiding brides through every aspect of a Tlaquepaque wedding. Sedona Bride Photography will beautifully capture every moment. Coordinator, Laura Marolakos, will plan every detail. 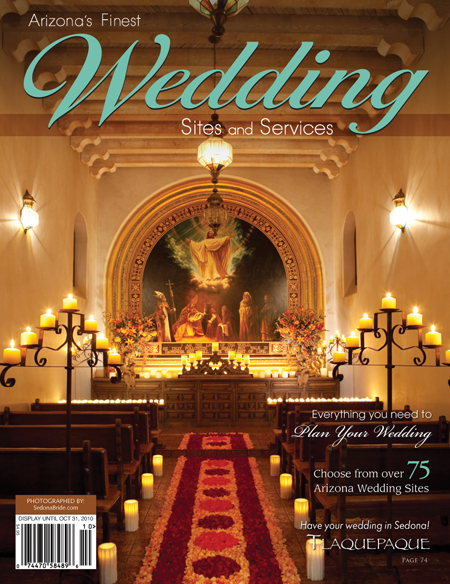 Reverend Andrew Murphy will officiate, evoking the emotion and importance of your special wedding at Tlaquepaque. 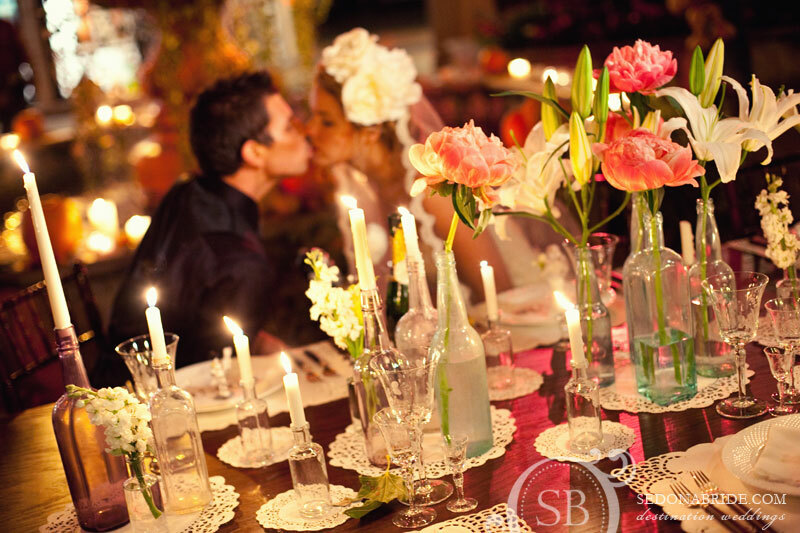 Events by Show Stoppers will bring the ambiance to life with flowers, lighting and decor. Come to Sedona and see for yourself why Tlaquepaque Arts and Crafts Village is such a popular venue for Sedona’s destination bride. Click HERE to see more pics from the fabulous shoot by studio member Sedona Bride Photographers.